The proposed education budget is bad news for the old school. Forget the spending freeze. Obama's Department of Education announced on Monday that it is asking Congress for more money in the 2011 budget. The department wants $49.7 billion in discretionary funds, roughly $3.5 billion more than it got in 2010. (That's on top of the $173 billion that would go to student loans, grants, tax credits, and work-study programs.) And, if Congress finally reauthorizes No Child Left Behind (NCLB)--it's already three years overdue--to include the president's reforms, the administration says it would allot another billion to the discretionary pot. But the really big news about the proposed budget isn't how much is--or could be--in it; it's how the new money would be spent. Instead of channeling new funds to states and school districts based on pre-existing formulas, the department wants to reward progress. 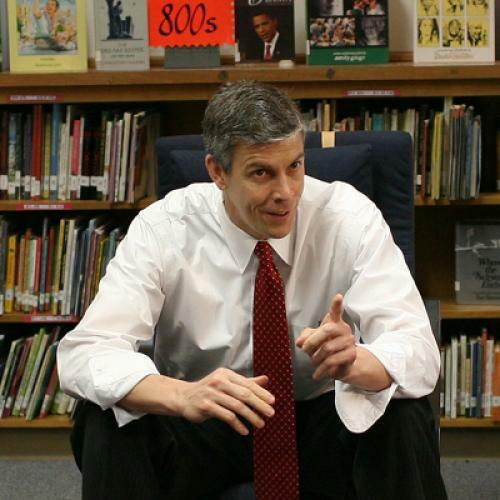 "Almost all the new money coming to the budget is competitive," Secretary of Education Arne Duncan told reporters on Monday afternoon, referring to a full $3 billion in the department's proposal. "We're absolutely philosophically and strategically moving more money, a lot of money, into a competitive basis." This represents an unprecedented shift in the way the federal government decides how to dole out education dollars. And, if Congress approves the budget as-is, it would build on ground-breaking work this education department has already undertaken--namely with regard to Race to the Top (RTTT), the competitive grant program that will soon distribute stimulus funds to states that have demonstrated plans for major reform. The budget proposal includes a $1.35 billion expansion of RTTT, as well as $500 million for the Invest in Innovation program, also created through the stimulus, which "makes competitive awards to develop and expand innovative strategies and practices." The roughly $1.1 billion left over for competitive funds would be used, among other things, to improve teacher quality and effectiveness, develop charter and other autonomous schools, and turn around the country's lowest-performing schools. Why the move away from formulas to competitions? In short, the education department is fed up with the status quo. Formula funds have been around for years, yet a fourth of high school students don't graduate, up to 60 percent of college freshman need remedial education, and millions of children aren't proficient in reading and math. "The philosophy that money still is somehow the answer is only going to hurt our kids more," says Jeanne Allen, president of the Center for Education Reform. Sure, under the education department's plan, formula funds would still exist. For instance, Title I, which distributes money to high-poverty schools, would be frozen at its current funding level, so that poor schools wouldn't lose the support from Washington that they've come to count on. But the proposed budget increases are truly pioneering. A slew of new competitive grants would compel states, districts, and local educational groups to change their policies and develop new programs, because additional funds would be contingent on reforms. These reforms might include liberalized charter school policies; alternative teacher certification pathways; new approaches to enhancing teacher quality; and plans to expand the social services offered in schools. "They're going to say, 'You have to put forth a plan that's progressive and impressive, and that's what we'll pay for,'" says Mike Petrilli of the Thomas B. Fordham Institute, an education think tank. "With a competition, you can be more aggressive, more prescriptive, more pointed." Of course, this being education policy, there are critics of the department's plan. Some are concerned that the race for competitive funds could create disparities. What happens, for instance, if wealthier states and districts are able to outspend more cash-strapped ones and prepare flashy grant applications? There is a "new level of uncertainty" about who will get money, how much, and when, says Joel Packer of the Committee for Education Funding. Ideally, as the education department has promised, grant applications will be assessed based on substance and need. What's more, there will be multiple opportunities to obtain funds. For instance, RTTT, the department's most high-profile grant program to date, isn't a one-shot deal--there are two rounds of applications this year, which will allow states to apply again if they don't get funding the first time around. And, if Congress approves the RTTT expansion, districts will also be able to apply directly for the money. Critics also say that proposing to expand RTTT and Invest in Innovation is a premature move, because these programs have yet to hand out money and produce results. But, even before applications were due in January, the first round of RTTT spurred several states to lift charter-school caps and make other legislative changes that would improve their chances of getting money. If that's any indicator, the programs seem likely to spur further change--so long as the education department rewards true progress. "Their instinct is right that they've seen a lot of positive movement from RTTT, a lot more than any of us would've expected a year ago and more than we're used to," says Petrilli. "What's going to be critical is if they're going to stay competitive and not fall into giving everyone their piece of the pie." Still, all of that is to be expected when an administration offers a budget proposal this cutting-edge. For its many other missteps, Obama's team has been consistently progressive on education policy. So let's give the education department its money, let’s overhaul NCLB, and let’s force those who've opposed reform at every turn to construct fresh arguments once the new policies are put to the test.